Mayor Damien Ryan and Chief Minister Paul Henderson got it very wrong when they claimed in media statements that the fires this week on Bond Springs and Undoolya cattle stations caused slight damage only. Station people were “out there constantly” during daylight hours fighting the blaze, says Jan Heaslip, of Bond Springs. 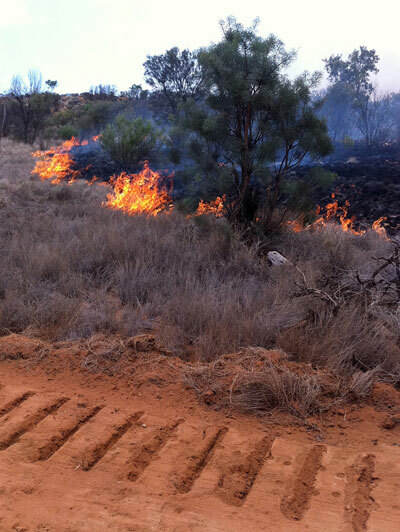 She described the fires as horrendous, destroying feed, fences and water pipes worth $10,000. There were also costs for a bulldozer and a helicopter. Her husband, Grant, kept an aerial survey on the blaze in the station’s Cessna, directing firefighters. The station crews were joined by Bushfires Council crews. Mrs Heaslip says she’s not asking for sympathy, but Mr Ryan and Mr Henderson should acknowledge the extent of the drama and the effort of the firefighters. Had it not been for them the blaze could well have spread into the Telegraph Station reserve or the town itself. At right: Bushfire front approaches fire break. Station people are self resourceful with their daily living, from children schooling, keeping their landing strips to aviation standards in case of medical help, re RFDS flights. Plus all the other day to day needs of being self sufficient on a cattle station hundreds of miles from towns. So fighting bush fires on their station is a major risk, to them, their home and families, their cattle, and all they have worked for. Everyone on stations are part of a large family, all working for their survival far from instant outside help. Fire is the biggest danger to everything they work for and fighting the fires alone is very much a part of station life in this beautiful country of ours. Every comment Paul Henderson (and Karl Hampton) has made about this years fires in CA has indicated he just has absolutely no idea. I too was quite disappointed (and surprised) to hear Damian Ryan’s comments going Australia wide yesterday am, I really thought he would have known better. When I heard him, he did makegood reference to the volunteer firefighters, but they’re never the only ones making an effort.